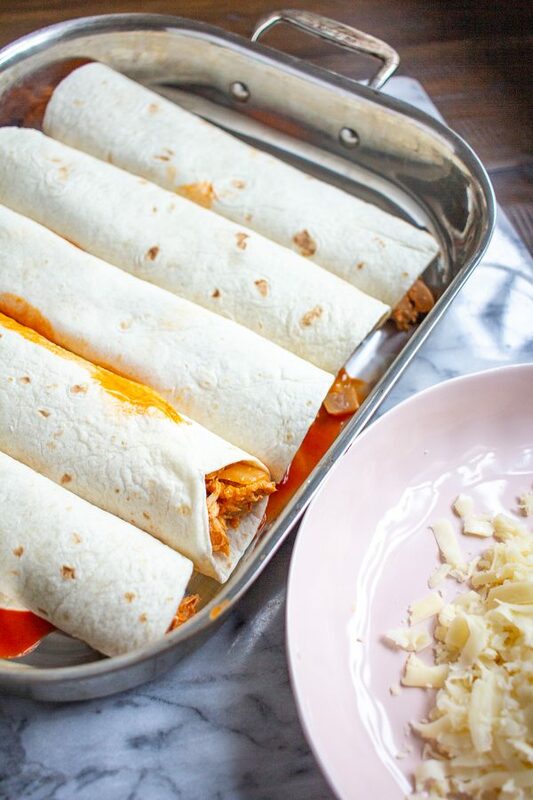 Buffalo Chicken Enchiladas is an easy Tex-Mex dinner recipe that has just the right amount of spice. I like to make a big batch and then eat leftovers later in the week. 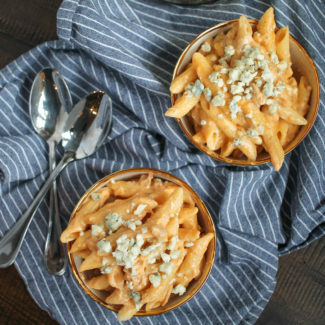 This recipe combines two of my favorite things: buffalo chicken dip and poblano cream sauce. 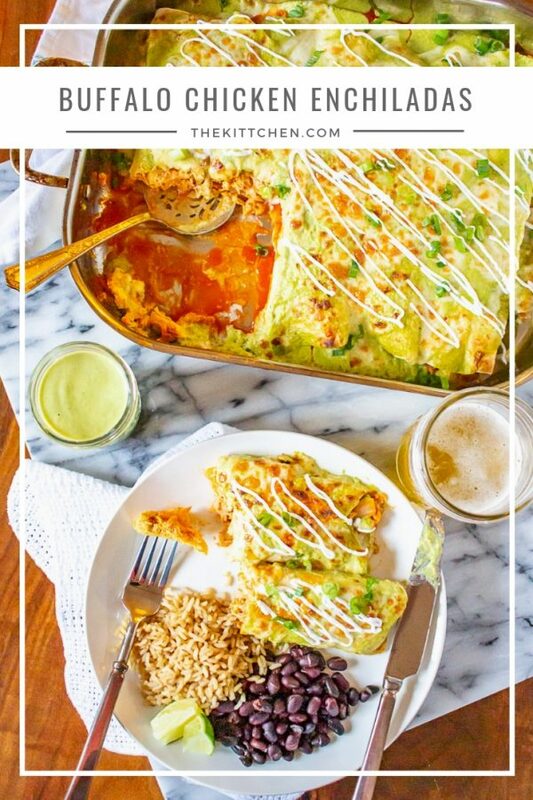 The enchiladas are filled with a mixture similar to my buffalo chicken dip, and then they are smothered in my cult-favorite poblano cream sauce. This time when I made the poblano cream sauce I used half and half instead of cream, to make it a touch healthier. 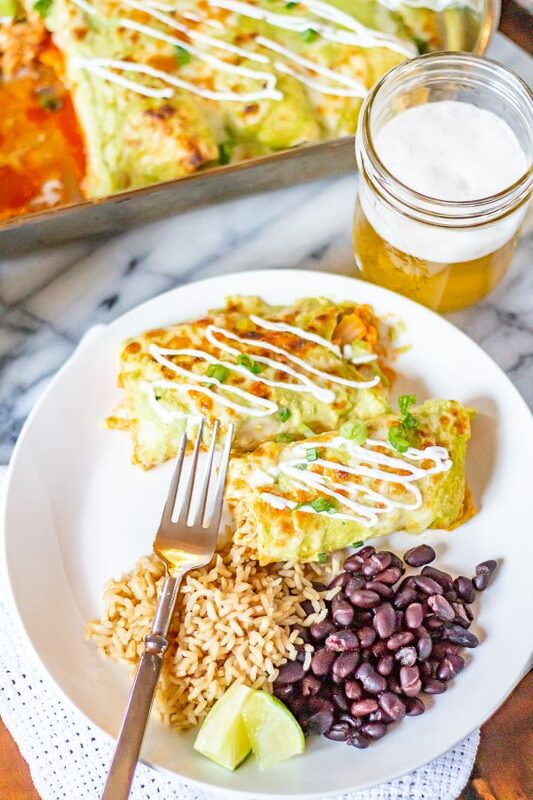 My Buffalo Chicken Enchiladas are made with flour tortillas filled with shredded chicken mixed with buffalo sauce, sautéed onions, and a touch of cream cheese that are covered in a poblano cream sauce and monterrey jack cheese. 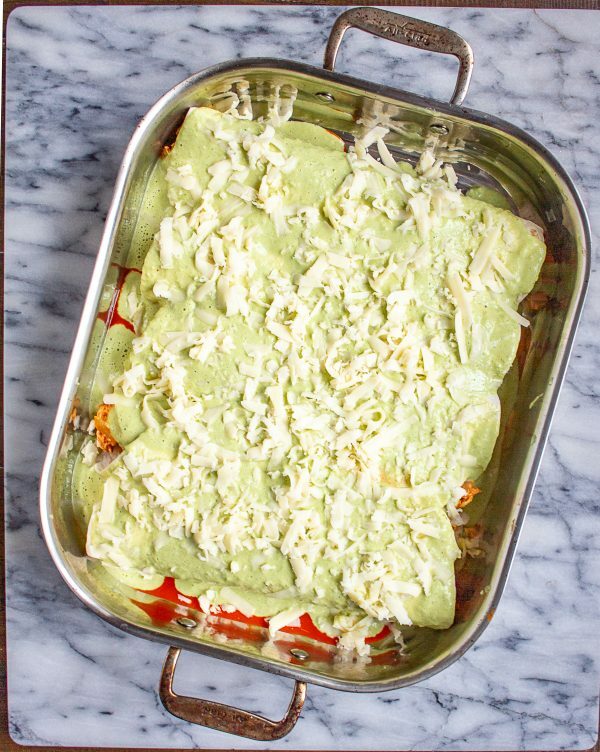 Most enchiladas are made with corn tortillas, but we prefer flour, so I used them instead. 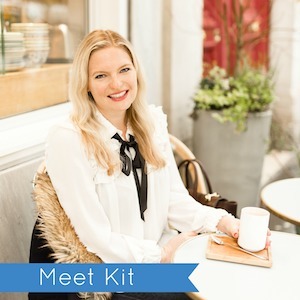 To prepare this recipe, you can either make buffalo chicken in a crockpot or instapot or you can do what I did and simply shred up a rotisserie chicken. 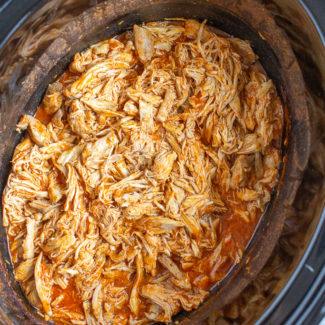 If you want to make buffalo chicken in the crockpot, but place 4 large chicken breasts in a crockpot and add a bottle of Frank’s Red Hot Buffalo Sauce and a packet of ranch dressing. Cook on low for 6 hours, and then shred the chicken with a fork. 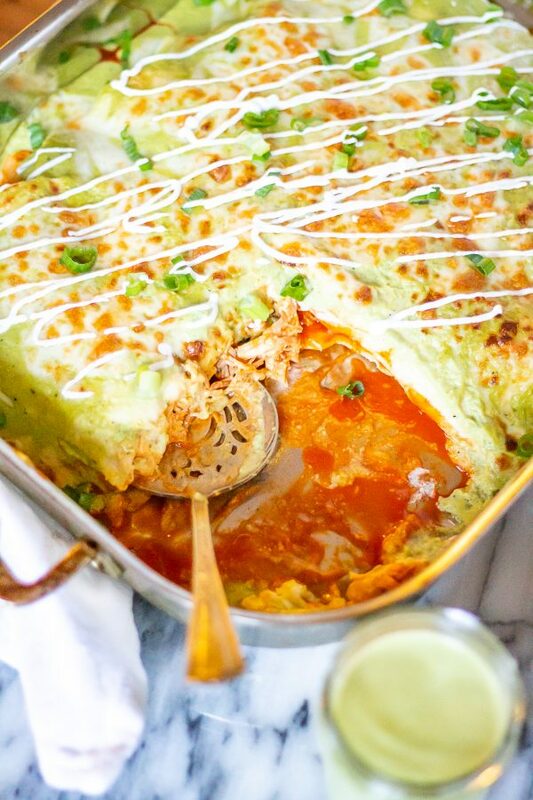 If you follow the directions exactly, these buffalo chicken enchiladas are on the spicy side. 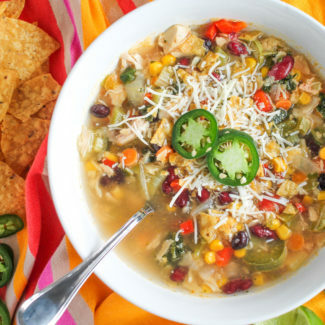 You can easily adjust the spice level by adding more or less buffalo sauce to the chicken, or more or less poblanos to the poblano cream sauce. You will have poblano cream sauce leftover. 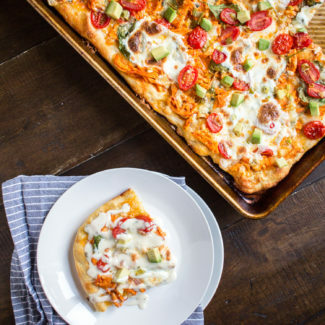 You might want to use it to make breakfast burritos, chimichangas, or add it to a sandwich, drizzle over nachos, or use it to dip tortilla chips. 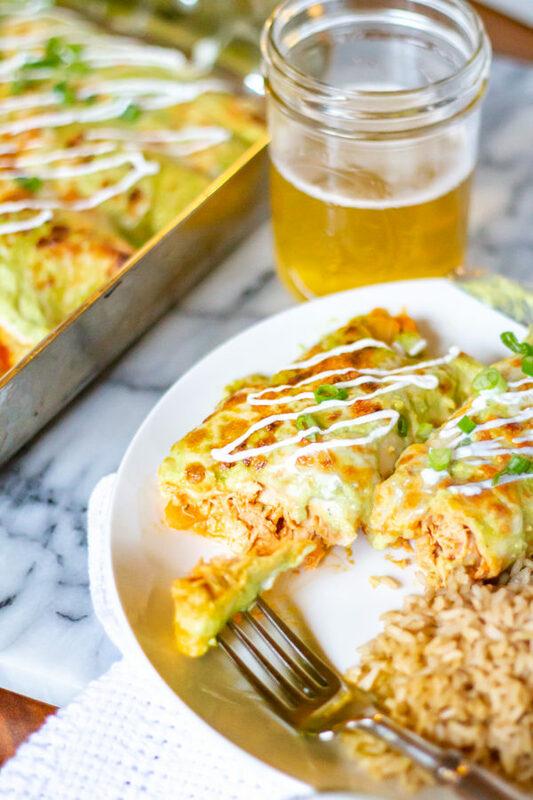 Buffalo Chicken Enchiladas is an easy Tex-Mex dinner recipe that has just the right amount of spice. 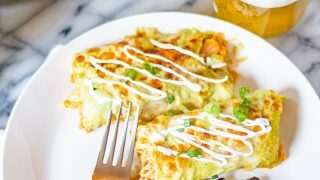 These enchiladas are filled with creamy spicy buffalo chicken and topped with a poblano cream sauce. 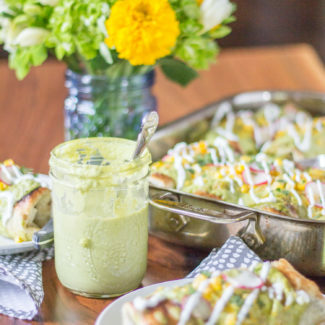 Prepare the poblano cream sauce, and heat your oven to 350 degrees. Heat the olive oil in a large skillet over medium heat. Then add the onions, season with salt and pepper, and cook until translucent. Next, add the chicken broth and the shredded chicken to the skillet with the onions and heat to a simmer. Pour the chicken and onions into a bowl and add the cream cheese, 3/4 cup buffalo sauce, and ranch seasoning. Taste test and add more buffalo sauce until the chicken reaches the spice level you desire. 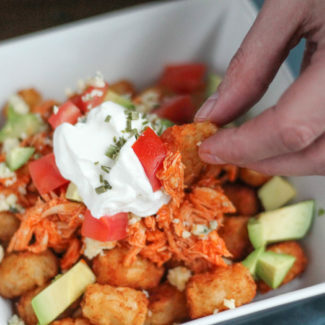 Pour 1/4 cup of buffalo sauce into the bottom of a casserole dish, and spread it into an even layer. Roll up the enchiladas next. Evenly spread about 3/4 cup of filling into 5-6 flour tortillas and roll them up. Place them in the casserole dish with the seam side down. 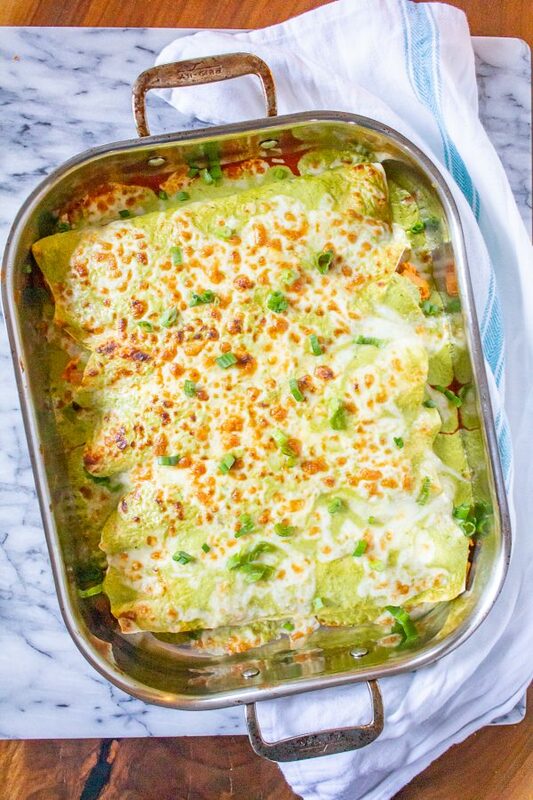 Pour 1 to 1 1/2 cups of the poblano cream sauce over the enchiladas and then sprinkle the cheese over the top. Cover and bake for 30 minutes, then uncover and bake for an additional 10 minutes.